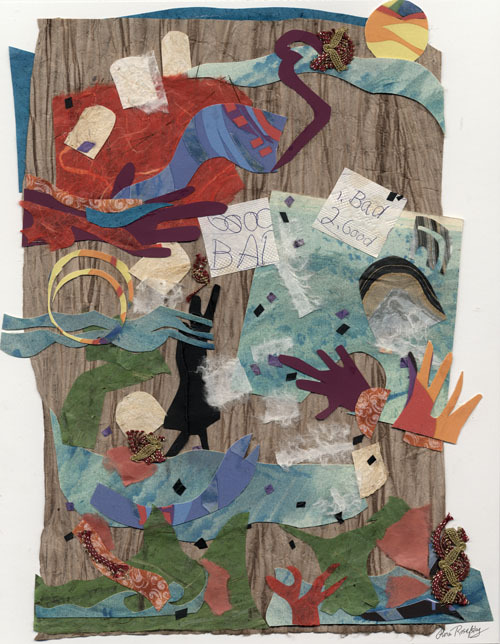 This richly textured collage, "Renewal", expresses a contemporary ritual conducted during the time of the Jewish New Year, also known as The Ten Days of Awe. This ritual traditionally takes place on the first day of the holiday, after the morning service where one can gather at a bridge or stand by a nearby river, stream, pond or lake, to literally throw one's sins, as bread and bread crumbs, into moving water- a metaphor to erase past misdeeds while praying with hopes for a good year. Using personal ephemera, hand-written pencil notes on a paper napkin, Flora Rosefsky asks, “Will the new year be "good" or "bad"? while leaving the question unanswered. Flora Rosefsky created Renewal as part of a series of nine collages expressing Jewish rituals associated with several Jewish holidays and festivals in a two person show in 2007 at The Art Station Contemporary Arts Center in Stone Mountain, Georgia with Lebanese born artist Helen Zughaib from Washington, DC. The show, “Shalom & Salaam: Sharing Our Traditions” revealed how the two artists and their families celebrated holidays inspired by their religious heritage and personal traditions. Rosefsky’s Ritual collage series was recently exhibited at the Marcus Hillel Center at Emory University’s gallery (December 2011-April 2012) and will be shown again, along with two other invited artist’s work, at the Jewish Federation of Greater Chattanooga, Tennessee October 25 through November 30, 2012. Opening artist’s reception October 25th. Curator and gallery director: Ann Treadwell. Copyright Flora Rosefsky. All Rights Reserved.